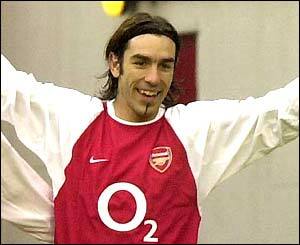 Robert Pires hit his 50th Arsenal goal, slotting home from close range to open the scoring in the second minute. Two minutes later, Patrick Vieira crossed from the left for the unmarked Thierry Henry to convert. Charlton, under the cosh for the first-half, clawed one back through Claus Jensen's fine free-kick and Jonatan Johansson hit the post late on. But Arsenal should have killed the game off long before Jensen's strike after producing a breathtaking 20-minute spell at the start of the match. However, for all their exquisite passing and movement, two goals were all Arsenal had for their dominance of the first half. And they nearly paid a heavy price when Johansson narrowly failed to equalise when his overhead kick hit the post in the dying moments. Warning had been served previously when Graham Stuart misdirected a header in front of an open goal with just over 10 minutes remaining. Arsenal had started the game at breakneck pace and their fluid football soon brought its reward. After approximately 20 passes and some smart exchanges involving most of the Arsenal team, Freddie Ljungberg provided the killer pass for Pires to notch his landmark goal. Charlton's left-sided weakness was then exposed moments later, this time Arsenal skipper Vieira rampaging down the flank. When he centred, Henry had plenty of time to pick his spot and double Arsenal's lead. For the next 20 minutes Charlton simply chased shadows and a cricket score looked on the cards. But Arsenal, and Edu in particular, opted for long-range efforts at goal and their cutting edge began to fade. Nevertheless, Charlton would have been relieved to reach the interval just two goals down. And the visitors emerged from the break evident on making the most of their reprieve. Matt Holland and Jensen began to compete in midfield, where previously Vieira and Edu had ran the show almost unchallenged. And it was Jensen who gave his side hope, as well as reward for their durability, when he made the most of a contentious free-kick decision for a foul on Paolo di Canio. As Arsenal protested, Jensen fired his shot into the corner of the goal via the woodwork. The goal buoyed Charlton and they pushed forward in search of a share of the points. They very nearly got it, as they took advantage of Arsenal's complacency, but were ultimately denied by the frame of the goal. Who is goin' to score the most no. of goals ? ?